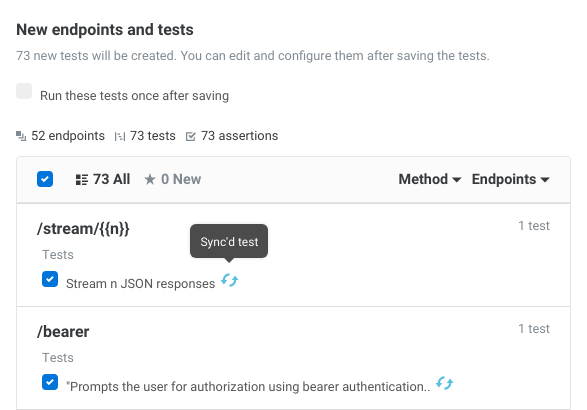 Automated API testing with an OpenAPI or Swagger specification just got a lot easier with Assertible's new sync feature. Read below to learn about how it works and how to get started today. Generating automated tests for your API from an OpenAPI specification has historically been a difficult task. Keeping tests in sync with changes to a spec was even more tedious. These are the big problems we're working on at Assertible and today we're excited to announce our newest feature: sync. What is sync, and how does it work? A response body is updated with a new or removed field. A query parameter is added or removed from an operation. A new endpoint or method is added to your API. In all of these cases, sync will save you from doing manual work to update your tests. Using algorithms to detect unique operations, Assertible is able to determine which tests need to be updated. This means that sync will work even if you have multiple tests for the same operation. Assertible tries to import as much information as possible from your specification, like the endpoints, methods, variables, and more. This same data is checked for changes during sync. When changes are detected, they are applied to the applicable tests. This is particularly useful when changes to the response body for an operation are changed. Assertible creates and updates JSONSchema assertions for your API responses, making it trivial to test the latest version of your API. Learn more about getting started with your OpenAPI or Swagger specification. Yes! Sync is available for all accounts and you can start using it today. This has been one of our most highly requested features, so please try it out and let us know what you think on Twitter or by sending us a message. On this page, you can import your specification from a URL or by uploading a file. Assertible will show a preview of all the new and existing tests found in the spec. New operations will show a star icon: . Existing tests will show a sync icon: . That's all you need to do! Confirm the import and Assertible will create and update your API tests. You can additionally choose to sync only specific operations, and optionally run all of your tests after the update. Automatic syncing for hosted specifications (e.g., from a URL or in a GitHub repository). Automatic versioning of specifications on GitHub that change in commits or pull requests. Supporting these workflows will be a huge improvement to testers and developers in charge of keeping the tests up to date and ideally provide a fully automated solution that requires minimal intervention. Sign up for a free accout and try out sync today!